I found one big, beautiful morel Sunday in the exact same spot where Mark found one big, beautiful morel last year. We'd probably try harder to find these elusive mushrooms, but we both think shiitakes beat morels in a taste test, hands down. 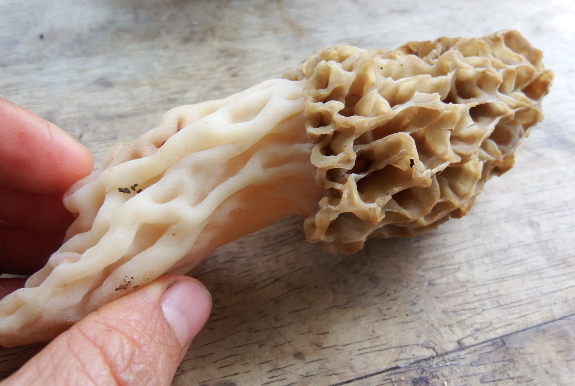 As a result, our total morel count for the last decade might come to five mushrooms total. If you don't have shiitake logs, though, this is probably a good year to go out hunting morels. I've heard reports of family and friends finding these tasty morsels in city cemeteries and in neighbors' yards. If there's any tree-covered green space near you, you might find one...or a bucketful...too! We actually have found a lot fewer morels this year than last. Then again, DS was the main harvester last yr and it wasn't as novel an event this yr, so maybe he just gave up a lot sooner.